Self-Exploration 4 – Who Am I? From the dawn of time, humankind has instinctively taken on and embodied archetypal forms (meta-forms) and patterns of behavior, both unconsciously and with spiritual purpose. This invisible groundplan molds both individual and collective psychic behavior. Psychic patterns, shared across cultures in countless energetic forms are buried deep in the manifold essence of our collective unconscious. Our stream of consciousness is a geyser of creativity. Creativity is an emergent property of extraordinary human development — a webwork of the interaction of various spheres of influence, and the complex feedback loops which bind them together. Emergent events are eruptions of the collective unconscious. The collective psyche points toward and guides us through the transition period we now face. New images are arising, reframing the future. Images have healing properties — inner dimensions of the healing response; and emerging worldviews. They speak to us in our sleeping and waking dreams, forging shared stories relevant to everyone in the process as well as the Cosmos itself. Our life journey is an unpredictable series of chaotic twists and turns which mold our lives, despite our best intentions and plans, as we wend our way toward our certain end. The ‘journey’ is a core guiding metaphor for our multifarious experiences. It is a poetic journey of self-discovery — this complex trajectory of emergent order from disorder, the complex dance at the edge of chaos. When spiritual emergence is very rapid and dramatic this natural process can become a crisis, and spiritual emergence becomes spiritual emergency. This has also been called transpersonal crisis. It refers to an awe-inspiring event that transcends the ego and can cause psychological and spiritual transformation. Normalizing and acknowledging the event can result in learning and transformation. Metaphors are only conceptual understanding without the experiential process of self-transformation to back them up. We are endlessly remaking or discovering ourselves and therefore always transforming — neurologically, cognitively and emotionally. We make tacit assumptions about evolution, progress, collective consciousness, complexity, and why they matter. They permeate the environment, couched in religious, psychological, and new agey lingo from metaphors of “paradigm shift” and “awakening” to “ascending”, and “transhumanism.” This radical change in consciousness mimics the spiritual ascent to the temple at the peak of the mountain of the philosophers. The umbrella term, “transformation,” becomes the new doctrine with its own dogma and sophisticated psycho-social marketing techniques with new accountability and top-down authority structures. Since ‘transformation’ is about moving toward the unknown and awakening the intellect to insight and realizations, it is virtually impossible to evaluate change processes meaningfully. How do we assess authenticity, validity, and issue-oriented change? Experiential reports don’t always coincide with events. The fulcrum of the process is our psychic being that includes our external nature. The path from the oblivious to self-aware life is beset with obstacles. How do we know what a genuine transformative experience is? We transform ourselves by every act of self-knowing. Jung felt that self-realization was a natural process of transformation, orchestrated by the unconscious. The infinite depth of dynamic reality informs our worldview and personal sovereignty. Such is the journey of meaningful solitude into silence, ratified by the perennial wisdom. Process-oriented therapies help us not only recover but make sense of our feelings and experiences by evoking our story, a meaningful narrative of our unique course. It is a combination of subjective healing fictions and our objective history, but expresses the reality of our psyche — our embodied soul. Dreamhealing uses images as portals for consciousness journeys to facilitate transformations ranging from mood alteration to profound physiological changes. Transformations can be effected within the autonomous stream of imagery, through imagery processing via experiential journeys. The essence of this transformative process is revealed in the fractal nature of imagery and symbols–i.e. their ability to encode, enfold, or compress the informational content of the whole. Emergent consciousness is not an epiphenomenon of the brain. Rather it is the transformational process of non-manifest, undifferentiated consciousness emerging into manifestation. Even if many have embarked on a similar quest, each of us makes this dramatic voyage of discovery for ourselves — we become our own Columbus of the soul, going where we do not know. It leads into the unknown where fearsome dragons (pain, suffering, loss, grief, illness, emotional devastation, mortality, our own personal demons) await to devour us. How we navigate those turbulent seas or traverse that undiscovered country is crucial to our wholeness and well-being…even as old explorers heading for the shores of death. If metaphor is central to embodied experience, we can find healing meaning embodied in our personal tales, which speak from the soul of the resilience of human spirit. This participatory process, a soul-making practice, creates a unique message, meaning, and body with poetic expression. We remember our soul’s journey and calling, related to our soul’s stories and moved by our struggles. We participate in this sacred act by correlating our experiences in the world with archetypal dynamics and epistemic uncertainty in relation to Reality, weighing the difficulties of interpretive strategies. Each spontaneous image can pull us out of our egocentric position into our emerging capacities and a panoramic view of cosmos and creation, the universal story of self-transcendence — a conceptually fruitful way of thinking. Artistic activities are flexible instruments for the investigation of imaginary worlds, metaphor of related real worlds. The metaphor of artificial worlds produces imaginary hypothesis for the real worlds — the art of emergence. Emergence implies natural laws and processes, their inherent beauty, and their action to yield the universe, us and the world we live in.Interactive artworks facilitate emergence and insight into the nature of emergent participant experiences. Visualization makes meaning of our images. As an image and as a reality, a new field may transcend an old one. The resonant energy of the old is transformed into the new field and resonates with other fields. Its strength is determined by how many fields it resonates with, increasing its potential as an attractor. The living image connects us to what is emerging in a coherent and tangible way. Our imaginal emergent fields are our organizational edges. Realizing we share the same field, the new paradigm encompasses psyche and Cosmos. Real awareness is being present in the moment. The confluence of future and past is eternally present now, pregnant with potential. Collective psyche “remembers” the future before it arrives, runs all superimposed scenarios in the multiverse before collapsing into ordinary reality. Ancient and traditional patterns are only fleshed out in conscious content, emergent knowledge, the emergent feminine, and embodied soul. Fundamental awareness has no intrinsic form, content, or characteristics. So awareness is less about the dualism of mind and matter, light or dark, reality and opinion, or polarized good and bad, but more about the dualism of awareness and the contents of the field of awareness — the symbolic, the mythic, and the subtle body, the emergence of new spiritual forms. Emergence is an organization change involving self-organization, autonomy, and circular causality. Images generate fields through subtle associations and correspondences with other, related symbols. Global order emerges from an interaction in a local, dynamical system, so that a whole new set of properties emerge. The emergence can be seen as unpredictable patterns of orders that appear through a process of self-organization. Emergence is a metaphor of nonclosure, of an open adaptive system. Complexity explicitly accounts for the interconnectedness of things and how that interconnectedness leads to fascinating characteristics such as adaptive behavior and emergence. Jung proposes a depth model to attain self-consciousness through recognition of the symbolic content of psyche which can be described as emergent. Emergence can be seen when unpredictable patterns of energy self-organize. These messy complex dynamics, a fundamental drive in nature, like images and symbols, reveal evidence of the creative power of incompressible “feedback”. Transformation is not linear or mechanical, but emergent. The emergent step is the critical turning point in the course of events. So emergence is an unpredictable wonder of complex nature. The idea behind the concept of emergence is that there are some complex phenomena which cannot be explained by the mere analysis of its parts or conforming elements. Definitions of emergent include arsing unexpectedly, calling for prompt action or urgent, rising out of or as if out of a fluid, arising as a natural or logical consequence, newly formed or prominent. Emergence is a universal process by which all behaviors, all structures, all networks, all ecosystems, all cultures are reinforced into existence. Contemporary paradigms in emergence theory create new possibilities for understanding. Jung writes about the idea of “emerging” in a variety of ways. At times he regards it as an almost organic and regulatory part of the work of the psyche. Jung notes that, “a symbol emerging in dreams is rejected…and even provokes an antagonistic reaction corresponding to the invasion….” Implicated in this is the resistance produced by consciousness to its own emerging growth. Opposing psychic energies, a conflict between conscious attitude and unconscious imperative for example, are ‘reconciled’ through the emergence of a third entity, the symbol. This observation feels closer to Jung’s somewhat enigmatic idea that individuation is a work against nature, or put another way, a work that seeks to transcend nature. Jung also writes about emerging as something that looks to the past for ideas in order to help with emerging in the present — a call to acknowledge the past interpenetrate the present as means for emerging new ways of being and doing, and bringing fresh insights into consciousness, innate longing for emergence of sacred revelation. The pattern of the whole must emerge full force, the emergence of new visions and values. In a paradigm of emergent change, existence is not a problem to be solved, but a pathos of the unattainable to be deepened into a search for insight — the emergent sacred. The creed of ancient Greece was, “Know thyself, and you will know the gods and the universe.” When Albrecht Durer applied the maxim to himself and his work, he revolutionized art. Knowledge, especially knowledge of self, is the root of wisdom. We can explore ourselves in a variety of ways — as self-actualization, self-development, spiritual discipline, self-realization, or soul connection. Our quest may be that of the hero, the fool, or the knight errant. Our own oracle or spiritual guidance lies in the depths beyond the threshold of our inner temple and holds the deepest secrets of our individuality and fate. The injunction is an invitation to enter the world of soul, of psyche. The oracle implies we will change our lives because the process of accepting the mysterious and our fate results in transformation. Our connection to the oracle — to nature, dream, and imagination — is a connection to the transcendent, to psyche. The Oracle embodies our enduring desire to inquire into what is beyond the here and now, and to try to control what comes next. She is the feminine spirit of the place, the sacred center, the naval of the world. She is the incentive for us to examine our own expectations, to confront our own desires and our own ways of make-believe. She personifies our archetypal yearning, the opening of human consciousness toward individual destiny. The collective unconscious guides the individual psyche through dreams, imagery, and imagination. The soul guides us on an epic journey into the great mystery of life. Hillman suggests, “When you ask, ‘Where is my soul? How do I meet it? What does it want now?’ the answer is, ‘Turn to your images'” (such as dreams and art.). We struggle with the ways in which we can become more fully human in a deeply connected more-than-human world. The Oracle mediates between two worlds, as does psyche. She is Mother Nature and the daimonic. The oracle helped identify which god or goddess was offended and what sacrifice would set things right. She was the true and only messenger of the gods. The messages of the Oracle were lofty but never arrogant. She always acknowledged the limits of knowledge. She protected the sanctity of life. Oracles revered the powers of the earth, its sacred springs and lofty rock formations — the suggestive power of the environment. The oracle is the mystique of the nonrational, the liminal between uncertainty and necessity, the chaotic life urge, the living processes of the soul. She presides from the sacred center of the world. The Delphic Oracle was referred to as the Pythia, or one who can foresee the future. She embodies the serpent or dragon of the collective unconscious and symbolizes the archetypal threshold. The Pythia, the high priestess of Delphi, was the highest spiritual authority and the only channel of divine will. Our own Oracle or spiritual guidance lies in the depths beyond the threshold of our inner temple and holds the deepest secrets of our individuality and fate. The injunction is an invitation to enter the world of soul, of psyche. Life as we know it is full of desire, passion, pathos, complexity, and paradox. This is the knowledge of experience that defies concepts and beliefs, a pathos that pines for the impossible in the face of the absolutely necessary. This essential question, ‘Who am I?’ lies at the heart of all philosophic, religious, spiritual, artistic, and scientific endeavors. When we personally respond to the siren call of self-exploration, we follow the ancient Delphic Oracle’s compelling injunction to ‘Know thyself.’ The Delphic maxims were all considered things we ought to devote ourselves to and practice, lest curiosity and the pursuit of beauty collapse into melancholy. Psyche is a source of knowledge. It is a refuge in times of doubt and uncertainty, where we can seek guidance straight from the deep source. Terrence McKenna said, “We have been to the moon, we have charted the depths of the ocean and the heart of the atom, but we have a fear of looking inward to ourselves because we sense that is where all the contradictions flow together.” The Archaic Revival (1991). The emerging Ground of our existence is the essence of wisdom. Emergent knowledge is the gnosis of direct experience aligned with modern empowerment, empathy, self-directed learning, and doing more than we consciously know. We develop an emergent perspective on the world around us. Emergence appears when systems are poised near a critical point of a phase transition, either by tuning or by self-organization. Feedback between individual elements of natural systems gives rise to surprising ordered behavior. Emergent behavior is not only more than the sum of the (temporal or spatial) parts, but quite different and unexpected. Knowing a starting state offers no predictability about the mature or emergent state. At each change the quality of the complexity is expressed as a new simplicity. The emergent quality is the summing together into a new totality. The phenomenology of images suggests that the nature of consciousness is emergent — self-referential, inclusive, and transcendent — individualized transcendence. The unconscious, inherent complexity, is organization without organizer. The process of self-knowledge is an end in itself; it never comes to a conclusion, yet encompasses our entire destiny. There is no clear, direct, one-dimensional path. The soul demands our courage and patience to reveal emergent mysteries while its labyrinthine nature leads us to deeper imagination. Insights in self-understanding come through grace, not labor or merit. Our universal vision is as limited as our rational and irrational human vision. Intuition exalts and redeems us through connection with our core — the midpoint of our internal Cosmos. True gnosis is an expansion of the consciousness field. But according to our concepts, beliefs, and assumed truths (psychological presuppositions), intuition can produce understanding or danger and destruction — wisdom or nonsense. Jung observed that belief is transformed into gnosis by individuation. Eternal knowledge or perennial wisdom is not intellectual but detailed knowledge of co-emergent forms of manifestation. Emergent complexity arises from one level that does not predict in any way the features on a related level of form and function. Myths are renewed in retelling with new spiritual language. In psychological insight, knowledge and understanding correspond with symbolic expression of the myth. Myths die when they no longer live and grow. The chthonic part of the psyche — undifferentiated consciousness — is our life-sustaining structure. Experiential knowing is a spontaneous creative phenomenon that reflects a rich reserve of ideas and images absorbed consciously and unconsciously, newly organized in novel ways — familiar material placed in a surprising and creative context — an achievement of particular genius. The soul understands what is sacred within us. The archetypal sibyl carries and informs the message of wisdom with loving participation in the deep meaning of inner and outer nature. The prophecies feature insights, paradoxes, metaphors and images that are also the heart of poetic language. What does the soul want? Hillman says more ‘soul-making’ than self-development, disciplines, or aspirational individuation. It is less about social superlatives and more about autonomy. Nature exists and deals with her processes without human aid, and has everything in herself to bring about transformations. The ancients who approach the Oracle were met with the hieroglyph Know thyself at the threshold of the inner sanctum. Entering the symbolic world, the threshold is a metaphor of conceptual boundary crossing, a portal to new knowledge. Existential knowledge — discovery of new insights — can be found in liminal or threshold experiences. It can happen to us unsought and unexpected. It doesn’t require belief, scripture, or Apocrypha. The transformative perspective, observable in its real effects, unlocks the hermeneutics of the creative imagination. The life of the unconscious goes on within us without our conscious knowledge. Gnosis is an emergent property, not merely an introverted religious attitude. Embracing gnosis does not mean embracing Gnostic dogma or medieval doctrines — participatory convictions based on personal desires and fears. The secret is inside the creation and based in the study of nature and our own nature. We become more integrated by bringing more of the unconscious and mythic into consciousness. Like the Oracle, it is a not-quite-understandable answer to our dissatisfaction. Formal, dogmatic Gnosticism is likely an inadequate container for our process. Gnosis is not Gnosticism. Such collective movements are not individual, and harbor old notions of perfection, evil, and idealism to be achieved through historical social and spiritual revelation, beyond human interference. But the natural process is existential, emergent, metaphorical, symbolic, and creative — not medieval and metaphysical. Its essence is that we learn about new factor of existence from life’s transitional or in-between experiences through deep reflection. It is a passage to new conceptual domains of understanding, interacting with, and perceiving human experience. The gnosis or knowledge we glean is the method of altering our being — a formula for our emerging self and spiritual autonomy without institutional organization. Old certainties are challenged and presuppositions dissolved by moving from one state or position to another — other domains of knowledge, beliefs, ontologies, and disciplines. Feeling the opposite of an image created by an original feeling has natural consequences. New attitudes are formed by contemplating the impermanence of self, knowledge, and world, reorganizing perceptions, projections, and awareness to empathic understanding. The liminal state instigates a dialogue between the old and new perceptions. Knowledge, experience, and meaning are conceptually restructured at each phase of reevaluation. We can reflect at the threshold, looking both forward and back. Crossing a conceptual threshold feels liberating. Threshold experiences shape our emergent knowledge and perceptions of self and world. Reflection is the interstitial event where we find gnosis or knowledge. It is a structure of positions through which we are moving to a new state or self-image. It is ritualized in many cultures as a path transition to new understanding of phenomena, and thus a rite of passage. Thoughts and feelings play with and generate new modes and reconfigurations of being. We create a plurality of new models for living that are part of the transformative process in the real world. We provoke change by applying those insights. The flux of human imagination shapes and reshapes our roles through regeneration, reconstitution, and appropriation. Gnostic ‘mass movements’ are an oxymoron and a modern invention. Knowledge of self that does not match with reality is a mental fiction lacking attributed value and conventional certainties. We change one way of relating to the world to another. Er understand everything around us through metaphorical associations, gaining new insight as we pass from place to place reflecting on the phenomenal world. Informal emergent knowledge is rooted in the gnosis of direct experience, taking into account that mental activity is dependent on the situation or context. Interpolations of deep reflection and conceptual boundary crossing allow us to discover insights in life that shape our emergent knowledge. Pro-active Emergent knowledge is one effective method for healing solutions. The Oracle embodies our enduring desire to inquire into what is beyond the here and now, and to try to control what comes next. She is the feminine spirit of the place, the sacred center, the naval of the world. She is the incentive for us to examine our own expectations, to confront our own desires and our own ways of make-believe. She personifies our archetypal yearning, the opening of human consciousness toward individual destiny. We approach the world with passion. The desire to be fully present here right now clashes with the knowledge and desire for death which informs our life and the nature of our imaginative possibilities. Myth makes the psyche, and soul informs individual experience with a psychic viewpoint made of psychic images. Psyche is the first reality and we are always soul. The dark oracles of the priestess arise from the unconscious, the primordial sea of time and space. Over and above knowledge itself we have to make a moral choice. We have to discern whether or not we can trust our instinct. Hillman says, “…put it my way, what we are really , and the reality we live, is our psychic reality, which is nothing but…the poetic imagination going on day and night.” (We’ve Had a Hundred Years of Psychotherapy and the World Is Getting Worse, p. 62) He calls soul, “that mode which recognizes all realities as primarily symbolic or metaphorical,…that unknown component, which makes meaning possible, turns events into experiences, is communicated in love, has religious concern [deriving from its special relation with death] ” (Re-Visioning Psychology, p. xvi). It is never a celebration of certainty. Tolerating the Unknown is our uncertainty, including our anxiety, ambiguity, illusions and pretentions. We follow on the invisible path. We have to tolerate uncertainty to face the unknown, acknowledging that there is a degree of the unknown in everything we do, unconscious trauma, and mental states without representation. The unconscious is the true psychical reality; in its innermost nature it is as much unknown to us as the reality of the external world. By definition the unconscious represents all that is true, but unknown, about ourselves. It is all that escapes actual consciousness, unconscious association of ideas and memories with unknown points of attachment, and unintended behavior. The source or cause remains unknown to us. The unitive processes of the instinctual unconscious remain the core mystery of the feminine principle. Unitive consciousness, original wholeness, accompanies the numinosity of the body, the collective cellular — the numinosity of the body. Soul has its own directions it wants to take. We don’t know what comes next, so we must stick with the images. The invisibles forever defy our definition and can only be imagined as metaphors. They have emotional power to possess us and govern consciousness invisibly, offering us a coherent way of perceiving, experiencing and imagining. Thus, we are left with intuiting the relevant unknown. But Intuition is not a replacement for being present, in intimate relationship to the unknown — transcendence, mystery, intuition. An attitude of expectation, a perceptive and penetrating vision this mode of knowledge is instinctive apprehension, intrinsic certainty, and conviction. We can follow our pre-reflective intuition into the vast unknown. We can unlock marginalized intuitive faculties that see subtle energies or imaginal prescience. “Intuition is not mere perception, or vision, but an active, creative process that puts into the object just as much as it takes out.” Jung said. (CW 6, para 610). Strong intuition comes from quality observation of our life experiences. The art of looking, listening and sensing (feeling) is what our experiences are trying to show. It isn’t perception of the unconscious but via the unconscious. The primary function of intuition is to transmit images, or perceptions of relations and conditions, which could not be gained by other functions. Its form varies from tacit knowledge to pattern recognition and constructive intuition. In this type of intuition, emotions may play a significant role, as well as various types of pre-conceptual ways of knowing. The Oracle mediates between two worlds, as does psyche. She is Mother Nature and the daimonic. Jung says, “the soul… appears now as psychopomp, as the one who shows the way…” (CW XII, p. 63) Nature is an incomparable guide if we know how to follow her. Seers, prophets and shamans are archetypal spiritual figures who promise us insight but they reveal the struggles of life as much as its joys. Even when the guide appears, we may be uncertain how to find our soul and reconnect with soul life, much less how to heal our psychic wounds. Our inquiry doesn’t enter into inflexible definitions and fixed answers. Soul is unique, creative, and changeable. Our quest can be more like The Fool than the Hero, heroically self-centered and truth-seeking. We don’t need to impose a heroic attitude or imaginal pattern on all events. Rather than emphasizing the hero we return it to relationship with other archetypal patterns inherent in the unconscious. The ‘hero invites subtle forms of self-deception. Hillman supersedes the concept of the archetype as objective inherited pattern, replacing it with a multiplicity of archetypal images as existent within the natural world. Hillman emphasizes the development of a mythic sensibility in confronting the complexity and multiplicity of psychological life. Psychic reality is a continually creative process of imagination and metaphor coextensive with the world of myth and shaped by necessity and dramatic reversals. The Oracle is a soul figure. We meet her when we inquire within with a feminine approach to imagination. It isn’t physical, mental, or metaphysical. The collective unconscious guides the individual psyche through dreams, imagery, and imagination. The soul guides us on an epic journey into the great mystery of life. Hillman suggests, “When you ask, ‘Where is my soul? How do I meet it? What does it want now?’ the answer is, ‘Turn to your images'” (such as dreams and art.). We struggle with the ways in which we can become more fully human in a deeply connected more-than-human world. The oracle is the mystique of the nonrational, the liminal between uncertainty and necessity, the chaotic life urge, the living processes of the soul. She presided from the sacred center of the world. The Delphic Oracle was referred to as the Pythia, or one who can foresee the future. She embodies the serpent or dragon of the collective unconscious and symbolizes the archetypal threshold. Inside and outside, sacred and profane, psyche and matter, conscious and unconscious; the stable center that mediates between and holds the tension of the opposites; it is a place of possibilities where both sides have the potential to be seen and where energy has the opportunity to flow in either direction. We learn how to live our fate and craft our character in relationship to archetypal figures, numinous modes of experience; seeing through our personal and collective experience to the archetypal image behind it. Things always remain uncertain through our inner and outer, upward and downward movements. The invisible world reveals itself to our understanding in dreams and fantasies, visionary experiences, psychosocial interactions, and the depths of solitude. We never know in what form and to what purpose the gods will appear in our exploration of experience. Only through symbolizing the physical experience in the soul space are we elevated to an inner movement of the soul, and subsequent transformation. But we don’t have to force the change with our desire, strong ego compulsion or personal ambitions for spiritual metamorphosis. Sometimes we must undergo a major transformation in how they we the world. Sometimes not, if we save image, symbol, and even the “mystical,” from an analytic, disembodied reductionism. There is nothing inherently better about a story where we transform. Our questions are not heroic: What am I here to do? Do I have anything to offer the world? Am I any good at anything? What do I enjoy? The ambitious, developmental heroic attitude grabs onto fixed solutions and interpretations, slays dragons, and kills the imagination unless it serves a power greater than ego. 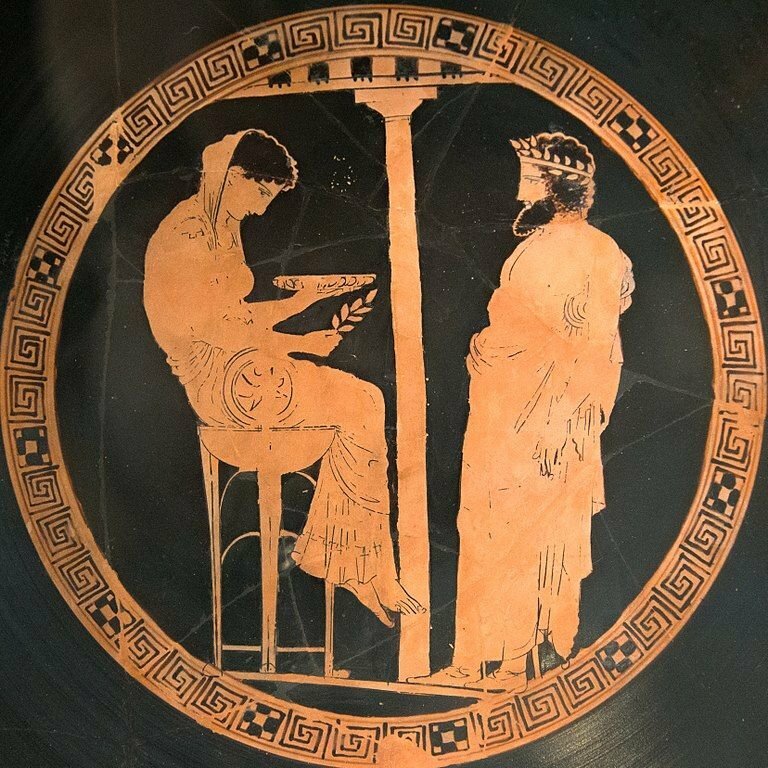 The oracle in Delphi doesn’t speak or conceal, but gives a sign. She is contact with the supernatural for divination and healing. For those who participate in them, symbols and myths carry their own healing power. The priestess surrenders to what flows through her, and what flows through is the whole world, the cosmos — the primal vital power of life. When we first turn in this direction we have no idea where it will lead or what is hidden in the depths of the psyche. But, psychic archetypes guide the individual psyche towards wholeness. Our own “messages” from the unconscious are often as cryptic and ambiguous as the oracle’s utterances. She does not reveal hidden consequences or specific predictions of the future. She favors truthful, but ambiguous and hidden answers. The catch is, if you ask the Delphic Oracle for advice, you are bound to fulfill the advice. With the power of presence, she commands we know ourselves now. Our complexes, symptoms, and dreams are all oracles. Consulting her is a life-changing, transformative, and numinous experience of encountering extraordinary powers of transfiguration. Our wounds drive us into ourselves, and can genuinely allow us an immediate and intimate contact with our soul. This will only happen if we can receive it as a numinous event, an archetypal moment. Possibilities rather than probabilities direct our attention towards those choices, attitudes, and decisions shaping our lives — feeling and sensing through to the heart of the daimonic. The Greeks called it “daimon,” the Romans “genius,” the Christians “guardian angel”. We call it “heart,” “spirit,” and “soul.” — anima or anima mundi. Anima is the ongoing source of life, the very breath of life that is generative, not only of the body, but also of what makes us human, giving us identity, personality and character, thereby shaping the way we perceive, understand and make sense of the world. The ancients understood soul as the carrier of one’s genius or daimon. This invisible otherness is an animating force connecting us to the ancestors and to the gods themselves. She embodied the holiest of all mysteries: of the possibility of human connection and communication with the divine. The Pythia eludes all attempts to demystify her. She helps us align with our destiny. We learn how to be who we are, not simply shaped by collective and cultural forces. Her mind still moves through all time and space in divine ecstasy. The oracle helped identify which god or goddess was offended and what sacrifice would set things right. The Pythia, the high priestess of Delphi, was the highest spiritual authority and the only channel of divine will. She was the true and only messenger of the gods. The messages of the Oracle were lofty but never arrogant. She always acknowledged the limits of knowledge. She protected the sanctity of life. Oracles revered the powers of the earth, its sacred springs and lofty rock formations — the suggestive power of the environment. ~ by ionamiller on January 12, 2018. Have You Been to the Paradox?